The wine is deep golden, with medium intensity. Developed nose with subtle notes of honey, apricot and fresh lemon juice. High intensity on the nose with a small hint of botrytis. On the palate the wine is almost full bodied with medium – fruit acidity. The balance stays upright with the very nice minerality, so the wine still seems fresh, even with 10 years in the bottle. Amazing length, where the fresh lemon aromas goes hand-in-hand with the mature tropical fruit. The mouth feel is almost like a Chardonnay, but with the freshness of a mature Riesling. The wine has a little sweetness, but not too much. 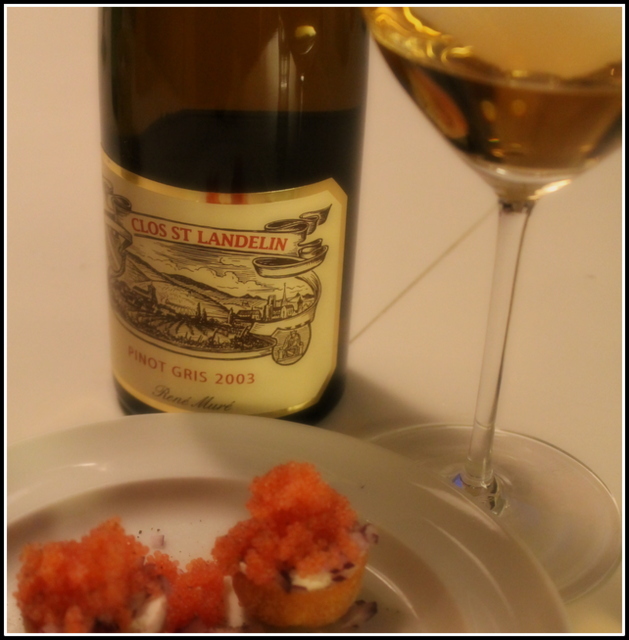 This is a very interesting Pinot Gris, and probably always one of my favorites from Alsace. 92 point. Served with lumpfish roe. René Muré is a domaine that is in a very interesting period at the moment. I have been tasting their wines for years. In the last years, since 2006 they have changed style, in my opinion. Earlier vintages was very opulent, with quite a bit of residual sugar. Even in entry-level wines, you could sometimes detect Botrytis. Very interesting, but not that easy to use. The new vintages have tightened up. Now I taste crisp wines with fresh acidity, and a dryer profile, with even more focus on the fruit. The wine tasted here, is absolutely in the more sweet style, maybe also thanks to the vintage. I have met Thomas Muré, who is now running the domaine a few times, through my old work with Skjold Burne. He is an interesting person, who is committed to the highest quality in all aspects of his winemaking. Lately he has turned the domaine into organic winemaking, almost on the edge of Biodynamic. Maybe this change has also been a factor in the way the wines have changed style. Here is a link to René Murés Facebook, where you can follow updates from the vineyards and more.